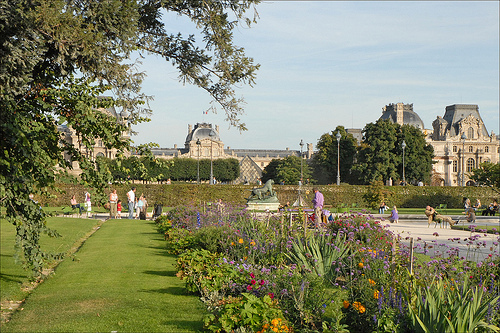 Below you’ll find our suggestions for where to pick up cheese, sweets, wine and other picnic provisions before settling in under the shady trees at the Palais Royal or in the Tuileries. Eric Kayser – Don’t let the multiple locations fool you into thinking that this is some kind of mediocre chain bakery: The breads at Kayser are excellent (ranked #1 on our list of Five Great Baguettes in Paris). Julien – Dorie Greenspan gives you permission to cut in line for a baguette. Le Petit Vendôme – If you really want to lunch as the locals do, visit this old fashioned Auvergnate casse-croute and snag one of the best jambon-beurre sandwiches in Paris. Verjus Sandwich – Packaged in parchment and twine, Verjus offers riffs of famous American sandwiches to-go. Options include fried chicken, duck meatball, wild boar confit and even a vegetarian sandwich if you ask nicely. Pierre Hermé – Join the hushed masses who queue worship at the altar of pastry demigod Pierre Hermé. Tarts, cakes, chocolates, ice cream and, of course, macarons. Gosselin – Gosselin’s baguette was rated fifth best in the city in 2010, and we included it on our list of Five Great Baguettes in Paris. Jean-Paul Hévin – Whether you go for a pastry or a box of perfect bonbons and truffles, Jean-Paul Hévin is a must for any chocolate lover. Hugo & Victor – Pastry chef Hugues Pouget gives classic and seasonal flavors dueling personalities – the innovative Hugo and more classic Victor – in this sleek boutique. Macarons, chocolates, and breakfast treats are on offer, too. La Bague de Kenza – Fragrant, sticky-sweet Algerian pastries that transport well and hold up in the heat. Aki Boulangerie – Put a Franco-Japanese spin on your picnics with fusion flavors like green tea & red bean brioche from this bakery. Sandwiches and pastries to-go, too. Legrand Filles et Fils – Lovely Legrand occupies an enviable place off the galerie Vivienne where you can snack on the spot, but they also sell bottles go. Le Garde-Robe – Organic and biodynamic wines abound at this bar à vins near the Louvre. Juveniles – Bottles to go at this wine bar, formely run by the inimitable Tim Johnston (a Scot!) and now run by his charming daughter.